According to the results of 2015-2017 years, Belitsoft is among TOP-30 largest IT companies out of 180+ in the High-Tech Park of Belarus (aka Belarus Silicon Valley). Belitsoft has a residency in the Hi-Tech Park since the 2009 year. 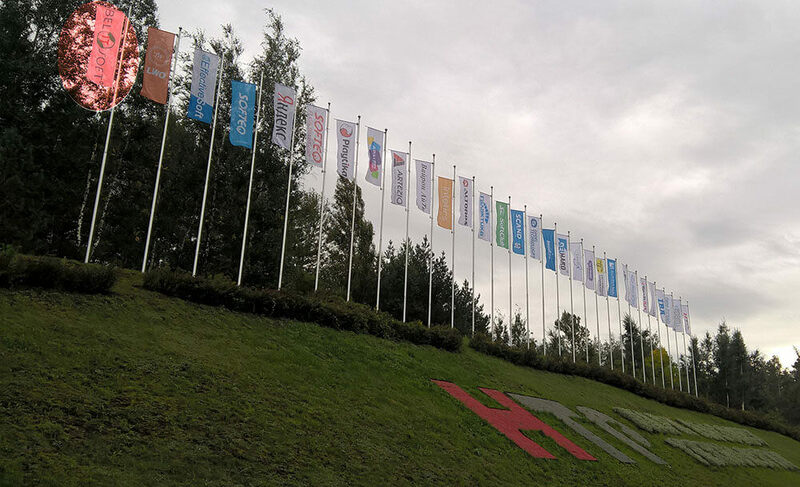 These are the branded flags of the TOP-30 largest IT companies in Belarus near the Minsk ring road (MKAD), where HTP is located. Belitsoft&apos;s company branded flag is the first from the left on the picture above. Belitsoft is an official Microsoft Gold Partner Application Development Company since November 2015. Our status is the highest level of partnership and reflects not only the highly qualified staff and software quality of Belitsoft, but also proves the significant experience as a Net app development company. The ISO 9001 certificate is the guarantee of the company&apos;s competitive strength both at international and national levels. That is the proof of its products and services quality and professional capacity for the company&apos;s clients. Belitsoft successfully passed all the ISO 9001 certification stages, including staff education, quality management system development, and testing certification. Independent Washington-based B2B ratings and reviews agency Clutch has recently released updated research on the top software and web developers in Belarus. 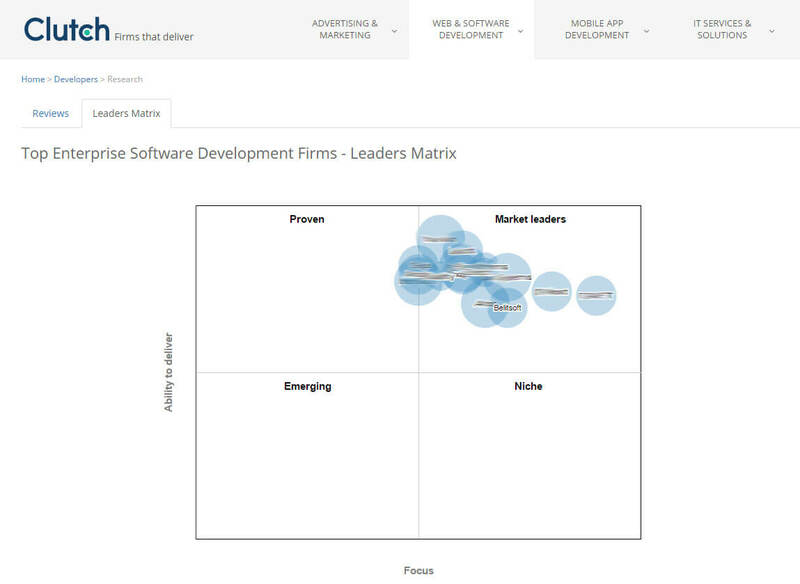 Belitsoft was confirmed in the Top Leaders Matrix as a top custom software development company from Belarus (Market Leader). Clutch Agency ranks more than 70 software development companies from Belarus. Showcasing the best outsourcing software development companies is an ongoing effort by Clutch. Each year, the Agency takes into account Belitsoft’s clients feedback (they conduct independent in-depth interviews) to update the list of leading vendors with years of technical experience and highly competitive industry rates, firms with a proven record of success. Clutch also rates more than 300 enterprise software development firms from all over the world. Earlier, Belitsoft was listed in the annual Top 30 list of them. Clutch contacts current and former clients of the reviewed firm and get their input on a range of qualitative and quantitative topics: quality of services and deliverables, overall value, and conformance to cost estimates, ability to meet deadlines and meet agreed project schedules, willingness to refer a colleague to the reviewed firm. Earlier, the CIOReview (a technology and business magazine for corporate decision makers of enterprise IT) featured out Belitsoft among Top Most Promising .NET Development Solution Providers. According to the CIOReview, Belitsoft leverages comprehensive programming model of .NET framework to deliver various services including mobile application development for Windows OS, Custom .NET business solutions development, .NET software integration, and migration to .NET framework. This page contains customer reviews about Belitsoft posted on independent research and reviews directory Clutch.co. Belitsoft was brought on as a third party vendor to build a transportation management dashboard and a quoting tool. The work included reporting and invoicing features, load tracking, historical data, and more. Belitsoft dis the work on time with hardly any problems. They’re a professional partner that communicates well and knows how to work in a team. They’re unique in their ability to deliver quality code and in overcoming the time difference by responding promptly and completing work on weekends. I’m the CEO of a consulting company. We outsource C-level services, project management, and custom software development. For what reason(s) did your company hire Belitsoft? We were tasked with building a transportation management dashboard and a spot quote tool. We needed to add additional development resources for the LAMP stack to our team and selected Belitsoft. They came highly recommended and didn't disappoint. We needed to build a dynamic, customer-facing dashboard application to track in-progress loads and historical load data. We also wanted to provide the ability to drill into a specific load, provide reports and invoices, and visualize truck shipments from pickup to destination. We interviewed and checked references on multiple companies that were recommended to us. Belitsoft had the reputation of providing quality development talent, strong communication skills, and staff with multiple development language capabilities that were quick to get the job done. The scope of the spot quote system consisted of building a dynamic, customer­facing spot quote application to track quotes, bids, and set up carriers. The spot quote data consisted entirely of information given by the customer. It was built with a modern user interface and functionality that allowed for real-­time updates of data without requiring the user to refresh the page or use a timed refresh. The team consisted of a project manager, developers, and quality assurance specialists. The projects were completed in a timely fashion with very few issues. Their communication and teamwork were very professional and the teams worked flawlessly together. There was a time difference between us but all responses from Belitsoft were always within a reasonable timeframe and in fact, many times work was completed or enhancements were taken care of over weekends. What’s most impressive is the quality of their code, their quick response times, and professionalism. There are no areas for improvement, although, I would’ve liked to have had them on site and in same time zone. Belitsoft supplied engineering resources who developed an automated conversion optimization solution and prepared it for launch. Their involvement remains ongoing. Key highlights include demonstrated product ownership and uncompromising resource flexibility, especially when confronted with rigid timelines. They were serious, thorough and quick. We are a startup company developing conversion-rate optimization tools for websites. The uniqueness of our solutions sits in their automatic nature. Instead of being used for A/B or similar testing, all the marketing know-how is integrated into our software, so the process is automatic. I am the founder and chief executive officer of the company. What challenge were you trying to address with Belitsoft? I decided to outsource the development part of the platform and looked into options for this. Cost and lack of relevant expertise were the main drivers of that decision. The idea behind the solution belongs to me, and we have a patent application for it. We created a detailed scope document for it, based on which Belitsoft handled programming. We've used PHP, AngularJS, and MeteorJS for the software. Belitsoft assigned 2 full-time developers and a project manager to our project. How did you come to work with Belitsoft? Our agreement with Belitsoft was signed at the beginning of September 2015, but the work began earlier, in March 2015. We have an ongoing relationship. Belitsoft is a very devoted group, and they've considered the project their own from the very beginning. I wasn't treated as just a customer, and Belitsoft's team used "we" on a constant basis. How did Belitsoft perform from a project management standpoint? Belitsoft was available to me outside of working hours and on weekends. I had a meeting with a potential investor and needed to finish sprints in time. One of Belitsoft's developers worked continuously through the weekend for this. We have used JIRA for project tracking at Belitsoft's suggestion. They have used it for other projects and have created a specific instance for our company. In addition, I asked Belitsoft to communicate through our Slack, which we've been using continuously. What did you find most impressive about Belitsoft? I haven't worked with companies of this kind before, so it would be hard to distinguish Belitsoft. Out of all the companies that I approached for the project, Belitsoft gave me the most professional impression. They were serious, thorough and quick, which is exactly how Belitsoft handled the work later on. Are there any areas Belitsoft could improve? Nothing particular comes to mind. Belitsoft was engaged by a renowned mobile app developer to provide outsourced iOS development since the client lacked internal resources. Belitsoft is praised for their ability to manage a project and provide high quality iOS work for an important end client. Belitsoft is recommended for any outsourced needs. Belitsoft guarantees first-class service through efficient management, great expertise, and a systematic approach to business. We are experts in mobile development. Our company was founded in 2007 and has contributed to the successful launch of dozens of applications. We have won significant awards worldwide, including ones from GSMA Barcelona and Shanghai, Seoul Digital Forum, Asia Smartphone App Contest, Calcalist, and more. Our total installation base is in excess of 100 million. We needed additional development resources. We didn’t have the resources in-house, so we decided to outsource our work. Belitsoft developed an iOS application for one of our clients, doing a great job overall. I don't remember how we first started communicating. Belitsoft approached me, and we ran a test project. How much have you invested with Belitsoft? The total cost of Belitsoft's development was under $10,000. We started working with them in January 2016. We have an ongoing relationship. Having worked with Belitsoft as a service provider for some time, I must say that I'm very pleased with the company's policy. Their main concern is to provide quality customer service. Belitsoft guarantees first-class service through efficient management, great expertise, and a systematic approach to business. Given that the project was done on behalf of a client, we haven't kept metrics for it. Belitsoft's communication and delivery times were fine. We used Jira for project tracking. What I've particularly liked about working with Belitsoft is that they take immediate steps to speed up the development process if necessary, and find a solution to any problem that may occur. I would strongly recommend Belitsoft's services to anyone wanting to get the right IT products in the right place at the right time. 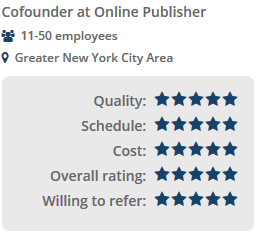 The client is an online publisher in the New York City area with a small team. There was a need to find a web development partner to help with coding work on a flexible basis. Belitsoft was selected to provide remote development services. The engagement has lasted for about six months and will expand later in 2016. The client is extremely satisfied with the code delivered by Belitsoft. They deliver clean code and changes very quickly with strong pricing and communication. Belitsoft is highly recommended to others. One thing that I like about Belitsoft is that they're able to make changes instantly. Requests that would have taken a week to complete in the past are now done on the fly. One of our internal engineers has commented about how clean their code is. Belitsoft seem to know what they're doing, which I appreciate. We're an online media company. I am a cofounder of the business. What business challenge were you trying to address with Belitsoft? We needed assistance with site maintenance and engineering support. Belitsoft have provided some SEO [search engine optimization] work for our site, but they haven't been involved in general design work. We picked them up after that work had been done. We work with an engineer that makes changes based on our requirements to elements like ad positions and so on. I did a lot of online research and spoke to four different outsourced engineering firms. Belitsoft were by far the most responsive, educated, and strong in their approach. I felt that they would be the best choice, and they've proved themselves to be just that. They were not the cheapest solution, but they provided the best value. The expected annual cost for their services is $40,000. We've been working together for six months. I am planning to build another website, for which Belitsoft will be used. They're a great team, and I enjoy working with them. They're good communicators. I receive updates and reviews on any task I ask for. Belitsoft don't do any half measures. When given a task, they will continue until the end. The only issue we've come across is the time difference. Morning in my region is afternoon in theirs, but they've been very flexible in this regard. Belitsoft have adapted to working hour changes without complaining. What distinguishes Belitsoft from other providers? Finding good, reliable, intelligent engineers isn't easy. The team at Belitsoft has been there for us whenever we've needed them. From back-end to front end, they have not disappointed us, and we've been consistently impressed with their ability, communication skills and flexible scheduling. I would highly recommend them to anyone in need of talented developers. Is there anything Belitsoft could have improved or done differently? Not yet. If you contacted me a year from now, I'd likely find something to complain about. We have five additional questions. For each of these, we ask that you rate Belitsoft on a scale of one to five, with five being the best score. 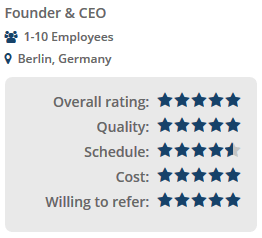 How would you rate them for the quality of their service and deliverables? How would you rate them for cost, as in value and conformance with project estimates? Five. They're not as cheap as the companies from Pakistan or India, but they're certainly not as expensive as American engineers. All the great engineers are being taken by Google and Amazon, so no one good is left locally. Belitsoft provide great value. How likely are you to recommend Belitsoft to a friend or colleague, out of five? 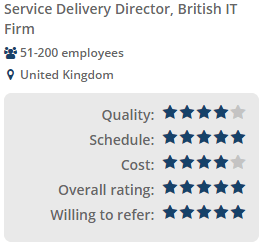 How would you rate your overall experience collaborating with Belitsoft? Five. I've worked with partner companies who were choosing overseas contractors that were doing a terrible job. I feel that I found a gem in Belitsoft. The client is a security middleware software company offering innovative products for enhancing efficiency and effectiveness of people, processes and technologies entrusted with securing business information. Limited access to development talent in house and a demanding project timeline required that the client find a partner to support the addition of new features to their custom security software. The client expressed great enthusiasm and appreciation for the work completed with Belitsoft. It was noted that Belitsoft is consistently able to deliver high-quality code within the specified timeframes. The client also praised Belitsoft for their ability and willingness to offer strategic insights. Belitsoft continues to support the client's development needs and comes highly recommended. The people we worked with from Belitsoft brought new, creative ideas to us constantly for evaluation. This was a major bonus because, while we expected development talent, we didn't necessarily expect them to be thought partners. IdentityLogix focuses on industries concerned with keeping business information safe and secure. Our offered software empowers businesses by giving them increased visibility into technologies employed by others that enable users to access business information securely. I'm the principal and co-founder. We needed to expand our in-house development team quickly in order to meet marketplace demands for new software features. These new features required skills that would have taken considerable time to cultivate internally. Our customers were looking to improve visibility for the following areas: troubleshooting, operational awareness, compliance, data analytics, and IT [information technology] services data integration. 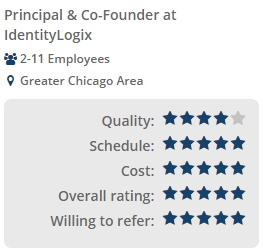 By partnering with Belitsoft, IdentityLogix was able to provide new capabilities for its customers using advanced identity and access management technologies to enable users with access to needed business information. Please describe the scope of their involvement in more detail. We were assigned a dedicated team of developers and QA [quality assurance] specialists, along with a project manager. We applied continuous integration approaches and agile development to enhance the quality of our software. We used Microsoft Azure cloud resources for development of C#/.NET and C++ for cross-platform components using Visual Studio IDE and other state-of-the-art technologies. We looked for a company that was big enough to draw upon needed resources as our development needs evolved and became more demanding. We wanted to to work directly with experienced developers who could understand the innovative monitoring capabilities we offered to the marketplace. We identified them and other potential providers through online research. 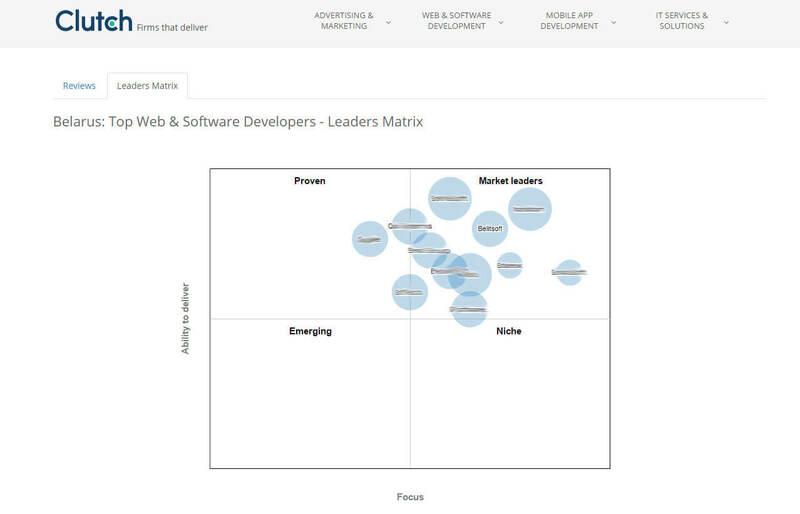 We looked at bigger companies, but selected Belitsoft for its right size and fit. They seemed to have a good amount of complex project experience to draw from, which also added a level of confidence. Our relationship is ongoing. We still use their services for our development projects. Could you share any statistics, metrics or user feedback from this engagement? We are very pleased with the results achieved by working with Belitsoft. Project communications were very good and timely throughout the project. Anecdotally, other stakeholders here have been very impressed with the reliability and quality of work delivered by Belitsoft. Without their support, it's unlikely that we would have been able to complete these projects within the specified timeframe and at the level of quality that we've been able to achieve. That's all thanks to Belitsoft. Is there anything that you would consider unique about their practice? Two things come to mind. First, the people we worked with from Belitsoft brought new, creative ideas to us constantly for evaluation. This was a major bonus because, while we expected development talent, we didn't necessarily expect them to be thought partners. They really helped us improve and streamline the development cycle. Secondly, there was constant attention paid to industry standards and best practices for software development. Their developers are well versed in the latest techniques and methods, which was a great advantage. In hindsight, are there areas in which they could improve, or things that you'd do differently? Our project experience has been fantastic, so I can't really point to anything specific. I'm sure there areas they could improve or enhance, as with any offshore provider, but those things didn't come up during our project so I'm afraid I can't be of any real help. We have five additional questions. For each of these, we ask that you rate Belitsoft on a scale of one to five, with five being the best score. 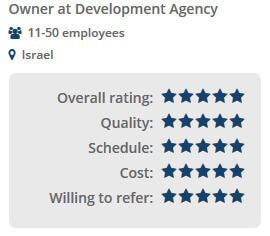 How would you rate them for the quality of their services and deliverables? 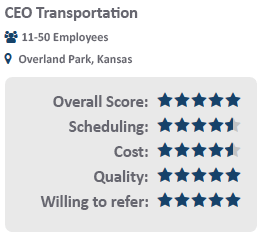 How would you rate them for scheduling, as in meeting your deadlines and/or compliance with a project timeline? How would you rate them for cost, as in value and/or conformance with original project estimates? How likely are you to recommend them to a friend or colleague? The client is an e-learning software company and a Microsoft partner based in Europe with offices worldwide. There was a need to outsource some software development work. Belitsoft was selected to build a basic yet high-quality software package for the client. The work has already lasted five years and will continue. The client is extremely satisfied with the work produced by Belitsoft. Belitsoft has produced quality work and manages the project well. There are no complaints to report. Belitsoft is highly recommended to others. We were able to build a high level of trust and communication with top managers and key people from their company, which helped us to achieve our aims. We are an e-learning company and a Microsoft partner. We are based in Denmark with offices in the U.S., U.K., Australia, and other European countries. We have about 50 employees and are growing fast. We are still a new firm. We are unique because we offer a software product that integrates with Microsoft SharePoint. We help people improve their e-learning programs through simple but powerful software. We have 300 satisfied clients worldwide. I am the founder, so I act as the CEO and head of business development. 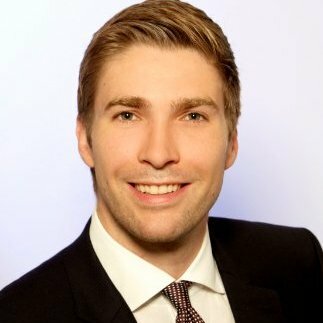 What were your company's business goals for the project? We wanted to create a world-class vanilla software to help medium to large organizations utilize e-learning in education. Can you discuss the scope of the project in more detail? The scope of the project was to create a software product from scratch. We intended to get full-cycle development, design, architecture, development, and maintenance, from one near shore provider. Why did you decide to use Microsoft SharePoint as the platform for this product? We are a Microsoft Gold Partner, so this was the best choice for us. SharePoint works for our needs, and we saw the opportunity to develop a great product to integrate with the platform. What was your process for selecting Belitsoft to work with? We had worked with them before on a small project and were very satisfied. It was an easy choice to go back with them for this project. Therefore, we did not create any short lists, but just continued working with Belitsoft on a new project. Can you give a sense of the size of the initiative with a general cost range? During the last five years, the development budget is more than $5 million. New versions of the product are still under development. What are the results of the project? We have realized that near-shore software development can be effective only with the right people on the team and good managers on both sides. Having both ingredients, we have achieved great results as we really built a vanilla software with more than 300 happy customers including Fortune 100 firms. When working with Belitsoft, is there anything else unique or special about them compared to other IT firms? Looking back on the project, is there anything that you think Belitsoft could improve upon, or something that you might do differently? Personally, I don’t like to look back and speculate about the problems that are already fixed. The future is more relevant. We ask you to rate Belitsoft for a few factors from one to five, with five being the top score. What would you give them out of five for the quality of their work? For schedule, as in being on time and meeting deadlines? For cost, as in value for your money and sticking with the original estimates? 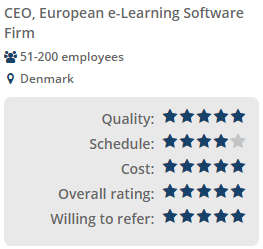 How likely are you to recommend Belitsoft to a colleague out of five? The client is a British IT firm that sells software products, and does IT consulting and IT recruitment. The client had a need to develop a new Web portal for its customers. Belitsoft was selected to develop the system to empower users to build their own service. The system has been launched, but Belitsoft will continue as a long-term partner with the client. The client is extremely satisfied with the work delivered by Belitsoft. Customer feedback has been positive, and the launch was successful. Belitsoft is responsive and hard working, and the client reports no negatives. Belitsoft is highly recommended to others. Their willingness and drive to understand our customer requirements really distinguishes them from other vendors we've worked with. Our company is in the United Kingdom, and we have several divisions within the company. We have an IT recruitment division and systems division, which has Microsoft-certified gold status. We do CRM install projects and Microsoft projects. We also have two products that we’ve developed. One is XRN, which is an IT recruitment tool. The other is MyHealthPlace, which is a service portal with a configurator tool. I’m the service delivery director. What was your goal for working with Belitsoft? We had the base portal platform already established. We used to build each of the individual services that the customers required internally. We turned that around, and provided a tool that empowered the customer to be able to build their own service that did not have specific IT knowledge and skills. We devised a product called a service configurator, which is a service accelerator product. It allows the customer, if they have their own clinical path of the service that they wish to produce – an example would be a stop-smoking service – they are able to enter the questions into various categories, sections, and panels. They’re able to put configuration between each of the questions so you can link them. If you’re a male, you go to one side, and if you're a female, you go to the other side. If you’ve smoked 20, or you’ve smoked zero, you can go a different way. There’s branching logic within the configurator as well. The configurator allows you to produce an invoice. If you’re providing the service on behalf of another commissioner, you’re able to produce an invoice for every service that you producer. The project with Belitsoft was to produce the actual service configurator, which would double spec in the design. They use their knowledge and skills to program the product, and then completed a series of quality assurance tests for us. We did an initial design, and they took that design and enhanced it to make it more into a detailed, functional spec. We were working in an agile way with them. We were looking for a partner to work with. We put an invite out to seven companies across the globe, and we narrowed that down to three companies. They came to the U.K., and made a presentation. We went to each of their companies, and did an onsite visit, as well as a due diligence visit. We then selected Belitsoft. Their offices are in Belarus. We met with their team. They were very helpful and knowledgeable in terms of what they were doing. They were very open in terms of the questions and the information we wanted to follow. We were able to sit with each of their teams, and to follow a historical project all the way through, end to end. We were very impressed with what they did. Their size, culture, and approach to work fitted very well with us, in terms of our size and culture. It was between £15,000 and £20,000. We’ve taken that project back from them, and we’ve done some further small enhancements. We are definitely looking at Belitsoft as a long-term partner. We have not yet found the next project for them to work on. It’s about timing, and the right type of project because we do a variety of projects. We do small enhancements on existing work that we’ve already done, or we do greenfield projects with new companies. That would be an ideal situation to engage Belitsoft with. The last milestone was completed in November of 2013. We just took that project into pilot with two users. From my point of view, that is a positive indication because we had to take them the product and demonstrate it to them. They had to build the service while we sat alongside them. They’ve been happy to use and accept the product, and now they’ve agreed to run it as a live pilot in their pharmacies. That’s two different customers of ours who are using that product. Belitsoft performed very well throughout the project. It was the first project, so like any time the first project occurs with a new company, there are learning curves on both sides. Language wasn’t a barrier. Approach wasn’t a barrier as we agreed on the approach, and we agreed on the best way to run the agile element through it because agile projects can mean many things to different people. Their willingness and drive to understand the customer requirements in order to get a defined spec and design of what they want to do is unique. No. I was very pleased with what they did. We ask you to rate Belitsoft on a scale of one to five, with five being the top score. What would you give them out of five for the quality of their work? Five. They tried very hard, and we have a good working relationship. It was worthwhile for us to go to them. A team of three of us went to their location, and we spent a couple of days with them. It helped language, understanding business knowledge when you’re talking on the phone or video conferencing on Skype. It helped everything come together. How likely are you to recommend Belitsoft to a colleague? Very much so, but not a competitor. You have to keep some jewels in your pocket.